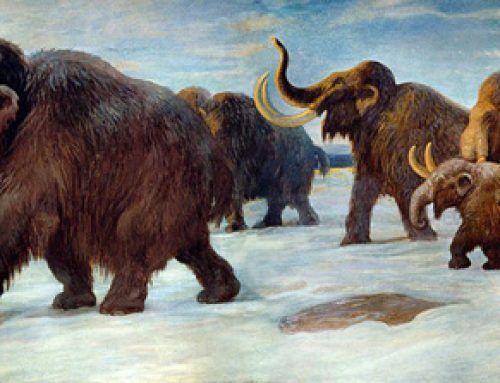 One of the great mysteries surrounding the Ice Age mammalian fauna, the likes of the Mastodons, Mammoths and Sabre-Toothed cats is their relatively rapid and sudden extinction in North America. The demise of these large, prehistoric animals seems to coincide with the demise of the North American “Clovis” people. Approximately, 12.900 years ago North America experienced a dramatic and rapid cooling. This climate change probably led to the extinction of the North American megafauna and the collapse of the Clovis culture. A number of theories have been proposed to explain why this period of sudden cooling took place. For example, around this time, it is believed that the giant glacial melt water lake known as Lake Agassiz discharged vast amounts of freshwater into the Arctic Ocean. This lake, which at its greatest extent covered an area of nearly twice the size of the United Kingdom, discharged such a volume of water that ocean currents were disturbed and this contributed to the rapid climate change. It has also been proposed that there was an extraterrestrial impact, however, this idea has been disputed. However, new research from Harvard University, a study of ice cores taken from Greenland that date to around 12,900 years ago adds weight to the asteroid/meteorite/comet impact theory. The American scientists found more than one hundred times the expected level of platinum in the ice cores, apparently deposited around 12,900 years ago. Did an Extraterrestrial Impact Event Spell Doom for North American Megafauna? This new data, published in the academic journal “The Proceedings of the National Academy of Sciences”, seems to support the hypothesis that an impact tipped the climate into a much colder phase. New platinum measurements were made on ice cores that allow conditions 13,000 years ago to be determined at a time resolution of approximately +/- five years or so. The hundred times spike in platinum levels coincides with a rapid cooling of the environment as indicated from oxygen isotope measurements, the start of a climatic period known as the “Younger Dryas”. The “Younger Dryas” started and finished abruptly, and is one of a number of shorter periods of climate change that appear to have occurred since the last glacial maximum of around 20,000 years ago. Each end of the “Younger Dryas” period may have involved very rapid changes in temperature as the climate system reached a tipping point, with suggestions that dramatic changes in temperature occurred over as short as time-scale as a decade or so. Such dramatic climate changes would have led to the collapse of many ecosystems with much of the mammalian mega-fauna becoming extinct as a result. This new paper, provides support to the extraterrestrial impact theory, observations of microscopic grains of diamond and the mineral lonsdaleite found in North American lake sediments also support the hypothesis of a possible meteorite impact. Similar deposits were found in the area surrounding the Tunguska impact event of 1908. Although no evidence of an actual impact crater has yet to be found, if a sizeable impact did occur, then debris thrown into the atmosphere could have influenced the climate and helped to cause the rapid global cooling. Sudden climate change would have put environments and ecosystems under huge stress and ultimately a number of extinctions would have resulted.